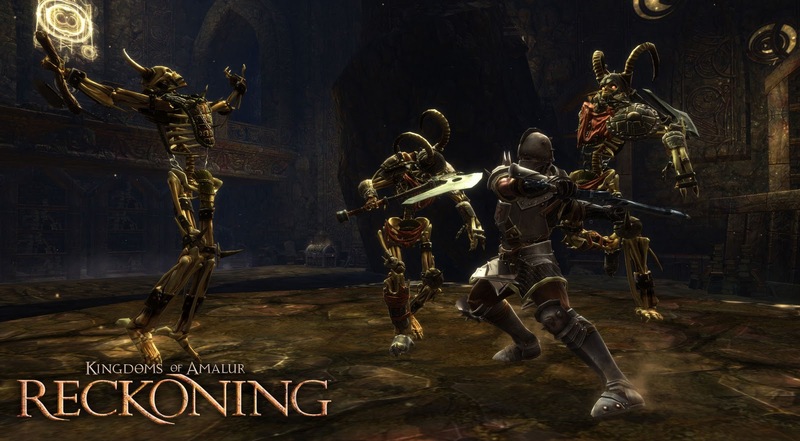 PREVIEW: Kingdoms of Amalur - Reckoning: Challenger for Skyrim? Kingdoms of Amalur: Reckoning is a massive open world single player rpg set in the fantasy world of Amalur. It’s a multi-platformer coming out at February 7th 2012 for US and 12th for Europe. The game will be released for Xbox 360, Playstation 3 and Windows (PC). It’s being developed by 38 Studios, Big Huge Games, and is to be released by Electronic Arts. Ken Rolston who was the lead designer for titles like Morrowind and Oblivion, acts as the game’s executive designer. By the way some lore and backstories are written by fantasy author R.A Salvatore, who has written 10 000 year biography for the world of Amalur, which is used as a game lore for the game. At beginning of story you’re dead, but for some reason you’ve been dug up from the pile of bones to be experiment by a machine called Well of Souls, which can resurrect dead. You’re actually first person to be successfully resurrected of dead by this machine. your past remains unknown and you’ll be given a second chance after your mysterious death. Well of souls has granted you access to change your fate, to be able to choose again from the scratch who you are and where you belong – and that’s what leads you to a character creation starting from an empty table. Dokkalfar – Sophisticated students of magic and diplomacy. While not shy from conflicts, they prefer to resolve disputes subtly and with grace, or efficiently, in silence. Racial bonuses: +1 Persuasion, +2 Stealth, +1 Sagecraft. Both Almani and Varani are human like races, while Ljosalfar reminds of regular elf and Dokkalfar of dark elf. Needless to say that elven races seem to nod more towards mages, and Dokkalfar should make the best thief-like characters. After picking up your race, you’ll also be able to pick your “Patron” out of six possibilities: Fire, Wisdom, War, Order, Justice or choose None and leave it blank. Selecting “Fire” for example sets Vraekor – God of Fire as your patron, which gives you +6% fire damage and +6% fire resistance. Choosing “Wisdom” would make Ethene – Goddess of Wisdom and Art as your patron, thus giving you +10% bonus to mana. The face creator for your character is also included, though it’s not quite as in-depth, as for example what Skyrim’s one looks like. It has several facial features to choose from ranging from Skin tone to eye features and lips. 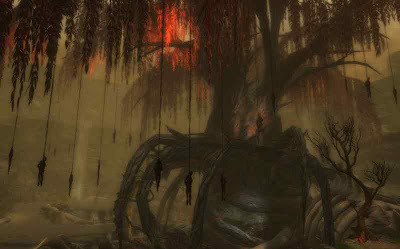 Other than that it has several different pre-made faces which you can modify with those previously mentioned features. The demo didn’t show though that you could modify shape of pre-made face, but there was many different faces to choose from to begin with. Ken Rolston, one of the developers of Kingdoms of Amalur stated that there are four different areas in RPG, which makes it whole: narrative, advancement, exploration, combat. He states that “all other areas been done good so far in rpg except combat”. That’s their main focus to fix. Combat is promised to be fast, dynamic and intense. It has look and feel of a combat game, and I have to say that personally it looked quite straight forward to my eyes, and I’m yet to find out what it is that makes it so unique that they promise it to be. 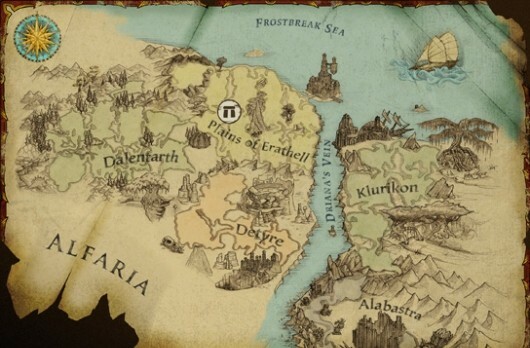 This game includes five different geographic regions which shall all have their own unique look and atmosphere. Each regions are filled with villages and cities, with citizens who have their own daily life schedules and routines. There are over 120 hand-crafted dungeons over the world, and yes, they have traps included. Main quest begins with your rebirth and not much is revealed of it yet. In addition to this, you have six different factions to join, of which each has their own faction quest-chain and story. There are also “hundreds of different side-quests” in addition to main quest and faction quest-lines. The game developers promise that the quests can be done in various ways, with different outcomes. Loot system should be diverse ranging with items ranging from huge amount of pre-made items to endless random generated items. Their rarity is defined by a color, much like in World of Warcraft. There are three different crafting systems in Kingdoms Of Amalur: Alchemy, which lets you create several potions to aid you, blacksmithing which lets you melt down the items you don’t need, and then use the melt down components to create new items at forge, sagecraft lets you merge shards and magic crystals into gems with magical powers, which can then be added to your weapons and armor. This is a bit like enchanting. All three crafting systems are well known from several previous games, and any RPG fan should most likely feel home right here. Nine non-combat skills are included in game. Few examples of this are: Detect Hidden, which lets you find secret doors, hidden treasures and ambushes. Dispel lets you disarm magical traps with a mini-game, which would otherwise blow on your face. Persuasion unlocks optional dialogue options in conversations, granting you either easier way of passing certain stage of a quest, or a better reward when finishing one. Stealth allows you to walk silently and backstab people with critical strike, pickpocket people, and trespass to the areas you don’t belong. Every time you level-up, you’ll be given skill points which you can then spend on skill-branch. The branch consists of three different categories, very much reminding of other classic skill branches like the one of World of Warcraft. The categories are: Might which is warrior likes, Finesse which aims more for finishing moves and stealthy gameplay, and finally Sorcery which needs no explanations. It’s pretty classic three way distribution. Every branch consists of 22 different abilities. You don’t have to choose just one branch out of tree, you can mix them up and create a hybrid of your like. 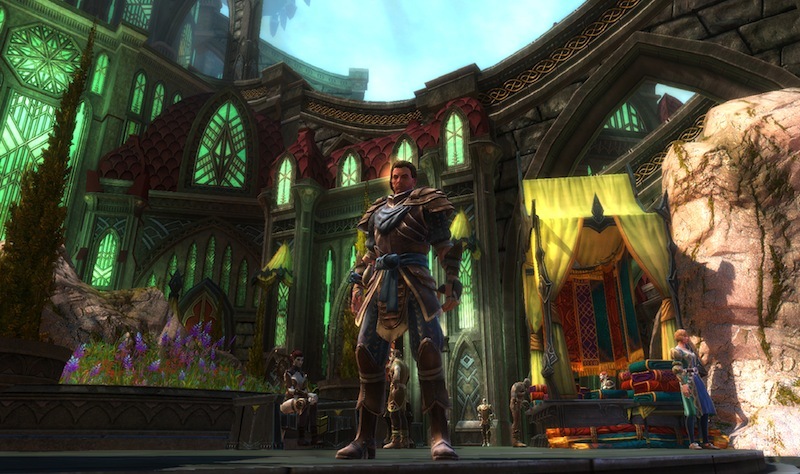 In Kingdoms of Amalur, unlike in Skyrim, you raise levels with classic way. You get XP for killing enemies and finishing quests, and when you reach required amount of XP points you’ll level up. The destiny system however brings something new to a table and I’m still to figure out what bonuses it actually grants, but it’s supposed to act as a class system for the game. When you start out, you don’t pick your class but start as “a blank card”. While you spend your skill points to abilities in skill-branch, you unlock “destinies”. Each of them require certain amounts to be spent on certain abilities in skill-branch before unlocked – and once you unlock certain destinies, you can switch them back and forth whatever feels the best for your skill-build. For example after you’ll be given your first three unlocked destinies which are basic rogue, mage and warrior, and after your choice it becomes your current class – but you can swap it to another when you unlock more of destinies. Now the destinies are named after character classes like: “Warrior, Avenger, Shadowcaster, Wayfarer” – and you can choose which of destinies to follow at any point of the game. After watching “A 22-minute video walktrough” host by Lead Designer Ian Frazier, he explained how to unlock destinies, but he didn’t really reveal what they do. I guess we’ll just have to wait, but my bet is that they grant significant bonuses to what type of a character class you play. Im just guessing here but I bet that for example unlocking “Warrior” destiny will grant you several bonuses for a skills that a warrior would be needing. To all the thieves there, stealthing is in the game, as well as the pickpocketing too. The thing suspicious about dialogue options is that the choice taking you forward skipping all the unnecessary conversation is highlighted with “blue” color. Is this like saying that the rest of the options are just lore or such, and thus don’t actually affect to anything at all? Hope not. The gameplay video shows the world, which is graphically more colourful and fairy-tale-like than for example Skyrim. Graphically it leans more towards mix of a something like World of Warcraft and Fable. Not quite as cartoon’ish as WoW, but not as “realistic” as Skyrim. Something in-between. Personally I liked what I saw in terms of graphical style and architecture in the game. Kingdoms of Amalur: The Reckoning seems to bring more the same old open world rpg than what we’ve seen before, with bit different level-up system ("destinies"), but it seems to have also very comprehensive character, skill and game system overall. Added to very large scale of the game, vibrant landscapes and standard rpg elements are there – I’m definitely going to check this one out at least. It seems like direct competitor against Skyrim, but is it up for a challenge? This video game is very interasting.I read this blog.It really interasting.Thanx to share it. I haven't addiction of games. But I like some games. I can't say this is my kind of game but yeah there are some good attractions in the game.